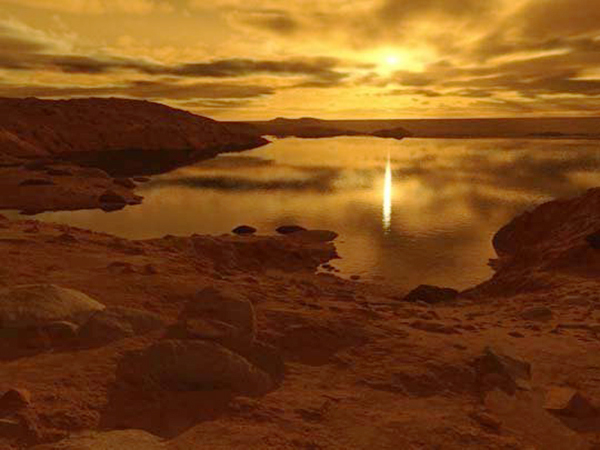 Illustration of a sunrise over a liquid methane lake on Titan. © Ron Miller. All rights reserved. Saturn’s largest moon Titan is often called an analogy to early Earth, with its thick, chemical-rich atmosphere and widespread system of flowing rivers and north polar lakes. But located almost a billion miles away from the Sun, everything on Titan is shifted into a completely different—and frigid—level of existence from that found on Earth. With surface temperatures of 300 degrees below zero F, the lakes are filled with liquid methane and what’s life-giving water here is literally solid rock there. Even the rain on Titan falls as oversized drops of ethane. But even in this extreme cryo-environment it’s possible that life may right now exist…life relying on an entirely different chemistry than what’s possible on our planet. Recently scientists have identified a molecule on Titan called vinyl cyanide, or acrylonitrile. To Earthly life acrylonitrile is toxic and carcinogenic; luckily for us it isn’t naturally-occurring here. But on Titan it is and apparently in quantity; it’s possible that vinyl cyanide, raining down from Titan’s atmosphere into its vast hydrocarbon lakes, could even help form methane-based cell structures in much the same way phospholipids do here. Fascinating! I love to learn! Great post! The whole concept of “life as we know it” is bizarre and I think mainstream science today is highly dogmatic. Given the vastness of our own solar system, galaxy and the universe itself, it is very probable mathematically that there are life forms out that thrive on what we call “extreme conditions”. Sipping a cup of sulphuric acid for breakfast.